This essential oil mixture is a formula based on an alopecia areata study published in 1998. In a short summary, 86 participants diagnosed with alopecia areata participated in the research by applying essential oils to the scalp everyday for 7 months. The first group (43 participants – half) massaged active essential oils (thyme, rosemary, lavender, and cedarwood) on their scalp in a mixture of carrier oils (jojoba and grapeseed). The other half (control group) only applied the carrier oil mixture (which is (jojoba and grapeseed). When the research team measured the results after 7 months, 44% of the first group who applied the essential + carrier oils show positive results, compared to 6% of the control group. 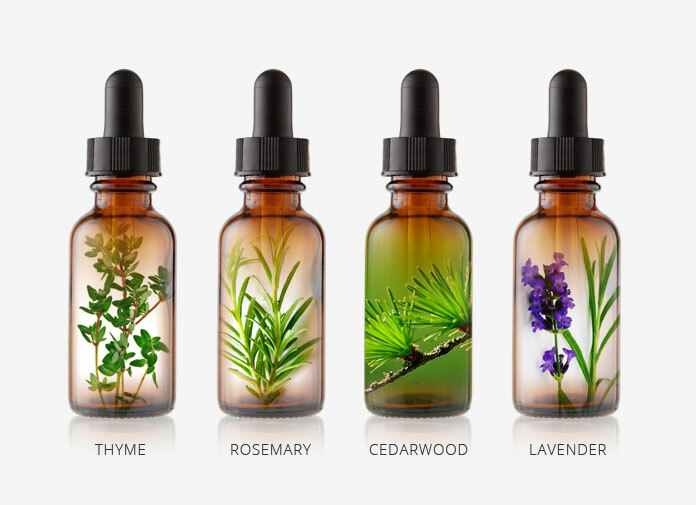 The results indicate that those 4 essential oils (or at least one of them) have the ability to stimulate new hair growth. NOTE: If you are suffering from alopecia areata, it’s worth following the exact regime. Even though there are quite a number of essential oils (total 6 to replicate the study) involved for this natural remedy hair re-growth treatment, the positive results are encouraging enough to follow each step. Massage the oil mixture (essential + carrier oils) into the scalp for a minimum of 2 minutes. Wrap your head around with a warm towel (or use a heat cap for the faster absorption) for better oil absorption every night. Continue for 7 months (as the study indicates). Remember: Nothing happens overnight when it comes to hair loss. Patience is the key.